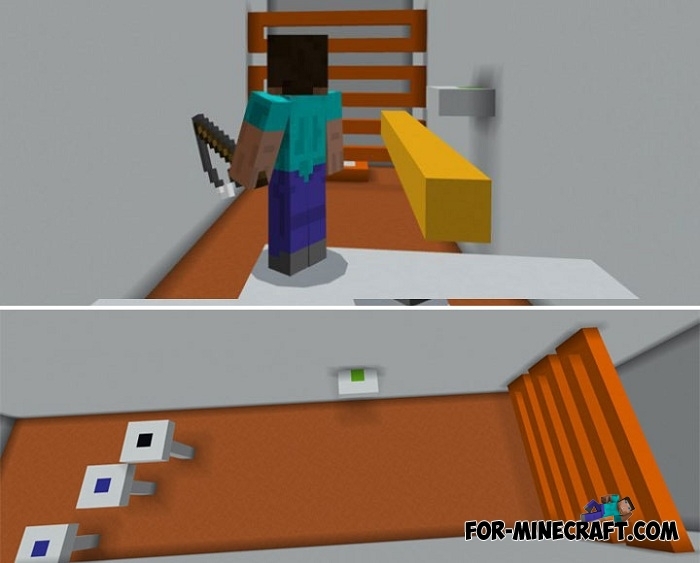 Even parkour maps are divided into several types: in the first one the player must simply jump, pass obstacles and not die, and in the other maps, the player is in a more difficult position. In addition to jumping, you need to think about the whole way from the beginning of the level to its end and to make it not so easy. The fishing rod is your main tool in this complex for both logic and for the fingers parkour. No, you will not fish, this fishing rod is designed to temporarily create a track from blocks. This works like a bridge that disappears a few seconds so do not brake. The fishing rod creates a horizontal line of blocks that is displayed for a very short time. Think about your path before you run, otherwise you will break or fall into the lava. Parkour Path map (Minecraft PE)The levels are very colorful, the author of the map made a lot of efforts to build a really beautiful background during the tests..